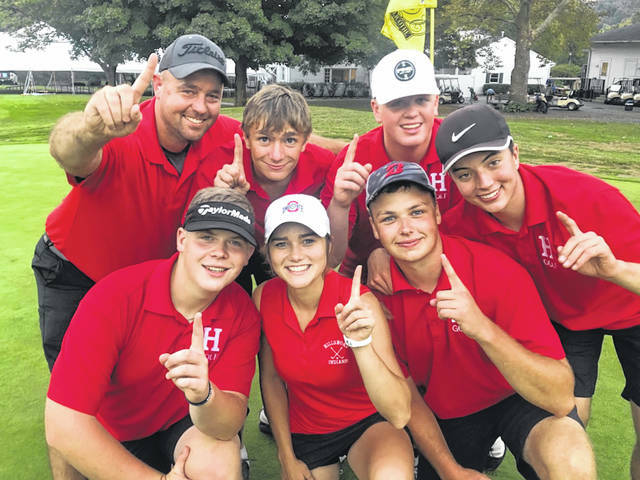 The Hillsboro boys varsity golf team members each hold up one finger on Thursday at Chillicothe Country Club where they won their final FAC match of the season and wrapped up the FAC boys golf championship. The Hillsboro varsity boys golf team and the McClain varsity girls golf team both finished off their Frontier Athletic Conference schedules on Thursday and wrapped up their respective FAC championships in the process. The Indians traveled to Chillicothe Country Club to compete in FAC match number four that was originally scheduled for Monday, September 10, but was postponed due to inclement weather. Hillsboro finished third in the match with a team score of 173 while Jackson and McClain were first and second with scores of 167 and 169 respectively. The Lady Tigers were in action at their home course, Buckeye Hills Country Club, for the girls FAC golf tournament. McClain was victorious with a team score of 408 and senior Bryn Karnes was the tournament medalist with a 95. The FAC also released all-first team selections for boys and girls golf on Thursday evening and Friday morning. https://www.timesgazette.com/wp-content/uploads/sites/33/2018/09/web1_Hillsboro-Boys-Golf-at-Chillicothe.jpgThe Hillsboro boys varsity golf team members each hold up one finger on Thursday at Chillicothe Country Club where they won their final FAC match of the season and wrapped up the FAC boys golf championship.